"No other color signifies a wedding more than white. Brides have been wearing white and ivory gowns for hundreds of years. The purity and simplicity of white creates an elegant and formal setting, making it an excellent option for a monochromatic color scheme. You may think that an all-white wedding is boring or lifeless, but think again. 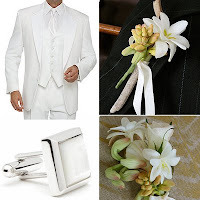 Check out some of our favorite examples of white touches that symbolize grace and elegance." *** we love good press!!! And "Lucky in Love" loves our Dellables White Sands Collection.